Maybe it’s an Aussie thing, but I’m very fussy with my pavlovas. Glossy, thick, white meringue topped with strawberries, kiwi fruit and drizzled with passionfruit. It just doesn’t get better than that for me. The sweetness of the meringue balanced with the sourness of the fruit keeps me coming back for more. However I’ve decided I need to shake things up and try new things. So I’m making an effort to be open to new taste combinations. And when I saw my daughter eyeing this recipe in the latest delicious. magazine, it was time to begin. Everyone loved this recipe by the way. I could (and did) drink eat the salted caramel on it’s own with a spoon. So after dinner I gave everyone a spoon and told them to go for it! And as you can see from the photo, not much was left. This pavlova was a visual feast and a taste sensation. Place egg whites and cream of tartar into a clean, dry mixer bowl and beat on high speed until stiff peaks form. Add sugar 1 tbsp at a time until all the sugar is added and the meringue is glossy and thick. Stir in the cornflour and vinegar, beat until combined. Spread the mixture onto the baking paper in an oval or rectangular shape. Reduce oven to 130 degrees C and bake for 1 hour or until the outside is firm but not browned. Then turn oven off, open oven door slightly and let meringue sit in the oven until completely cooled. To make the salted caramel place sugar in a saucepan with 1/2 cup of water. Increase to medium heat and cook, without stirring, until mixture turns golden caramel (about 10 mins). Remove from heat and pour in cream. Finally, return the pan to a low heat and add the salt. Stir the mixture for 1-2 minutes or until smooth. Pour salted caramel into a container and leave on bench top to cool. (This recipe makes a lot more caramel than you need! Leftover caramel can be stored in the refrigerator for a couple of weeks, if it lasts that long!). To serve, whisk the thickened cream with soft icing sugar until soft peaks form. Scatter your choice of berries on top. Tags: baking, berries, cakes, cooking, dessert, food, pavlova, recipes, strawberries | Permalink. That looks so amazing!!! 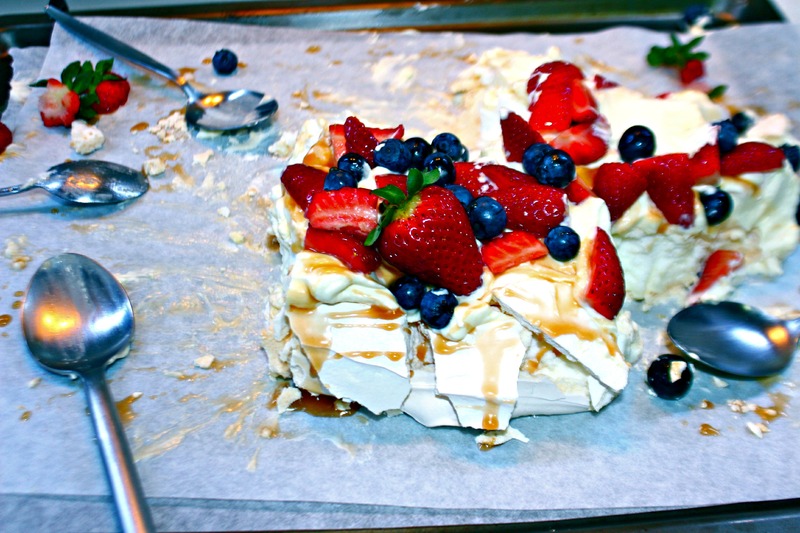 I loved Pavlova when I was in Australia, exactly as you describe it. But once I got back to the states, well it’s fallen off the list. Maybe because there’s really no passion fruit to speak of. This looks so delicious, I need to try it!! Beautiful!! Love the look of those colorful berries on top of the pavlova! wow! that looks amazing! I’ll have to try to make a Pavlova sometime.